So What Are Analytics Apps? Understand what prebuilt Analytics apps can do for your business. Describe what the Analytics platform and prebuilt Analytics apps are. Sign up for a special Analytics Developer Edition org. 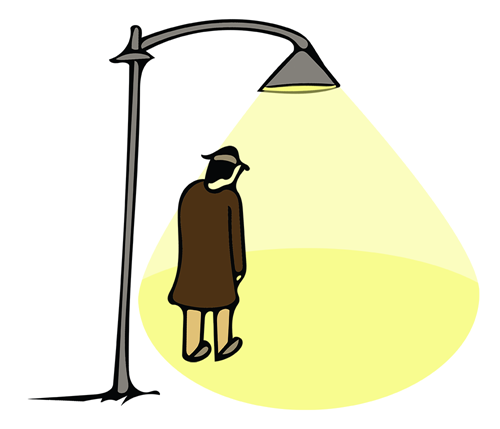 When you analyze data, it’s easy to look for business intelligence where the light is better. Looking in the dark corners can be complex—especially if you’re not a data expert. Prebuilt Salesforce Analytics apps take away the complexity and shine a light on all your Salesforce data. Analytics apps give you actionable analytics with ready-made dashboards that are automatically populated with Salesforce data. With minimal setup, they provide best-practice dashboards that show you key performance indicators (KPIs) so you can quickly see the state of your business, explore your data through visualizations, and take quick action on those insights. As in so many companies, Salesforce admin isn’t your only work for DTC—you’re also a business analyst and project manager, and you even meet with customers now and again. 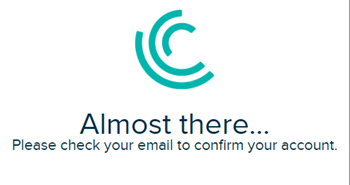 Who’s better equipped than you to anticipate the eventual needs of users throughout your organization? And who better to roll out Analytics apps and learn your team’s more detailed needs as they start to use them? 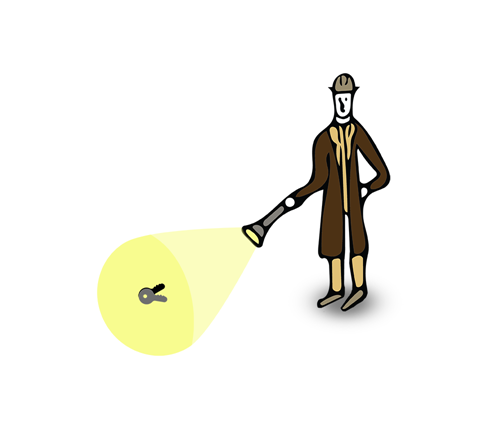 You’re giving everyone in the company a flashlight, and you’re there to guide them to the insights hidden inside their data. The team relies on your work for its success. You know they depend on quickly discovering key insights from data and taking action. The CEO made it clear that Analytics apps are the future of business intelligence at DTC. So you need to come up to speed fast. This trail helps you do that. You’ll learn what Analytics apps are, how they relate to the Analytics platform, how you set them up, and how to use them. Along the way, you’ll learn some key principles and terminology to help you dive deeper into apps and the Analytics platform. Analytics apps tell easy-to-follow stories about your Salesforce data—stories we’ve written based on our many years of helping businesses manage customer relationships. They tell their stories through interactive, ready-made dashboards that give you a visual summary of your data. 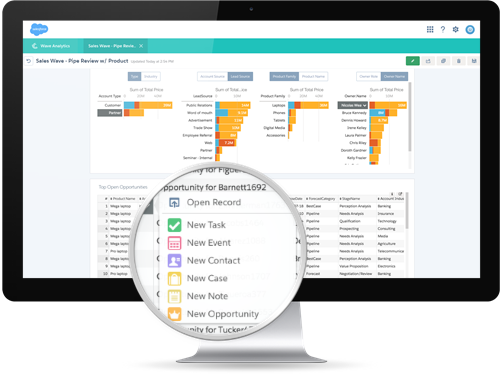 Our sales app, Sales Analytics, tells its story using data from the Sales Cloud. Service Analytics does the same with your Service Cloud data. And Event Monitoring Analytics pulls its data from Salesforce event logs. They show you the state of your business using the data you already have in Salesforce. And they can help you turn that data into smarter actions to accelerate new business. App setup is easy. Most apps include a the handy configuration wizard. The wizard asks you a few simple questions about how you use data. Either go with the preloaded answers we’ve selected or make your own choices. Some apps can be created without the wizard in just a few clicks. Analytics does all the heavy loading and lifting for you, while you grab a coffee. And if the app’s datasets, lenses, and dashboards aren’t just right, you can quickly tailor them through customizations that draw on the power and flexibility of the Analytics platform. And what is the Analytics platform, you might ask? Analytics gives everyone in your org who has the right permissions immediate access to powerful business intelligence through its intuitive point-and-click visual interface. It’s Salesforce-secure, trusted, scalable, and, of course, mobile! Whether you’re on a desktop browser or a mobile device—iOS or Android—you get the answers you need from your data to run your business. The Analytics platform lets you combine Salesforce data, data from external sources, and even spreadsheets, from across your business. It gives your team a single place to explore information, find insights, and take action. Dashboard. In Analytics, you explore your data through dashboards — collections of interactive widgets that bring your KPIs to life. Lens. You create lenses to get the views you want from a dataset’s data. They’re the visual tool you use to explore data, and they’re the building blocks for dashboards. Dataset. Lenses and dashboards are built on datasets, which are sets of source data, specially formatted and optimized for interactive exploration. App. Apps provides containers for sets of related dashboards, lenses, and datasets. Creating an app from scratch requires a fair amount of know-how: you have to load and transform the data, create lenses from the data, and design the dashboards. But prebuilt apps are like grab n’ go analytics. They have ready-made datasets, lenses, and dashboards built with your existing Salesforce data. They’re built on the platform, so the power of Analytics is always close at hand. Apps and platform licenses can be purchased separately. Okay, enough talk! It’s time to get your hands on an app. In this module, you’ll be using Sales Analytics, our sales app. First, you’ll run quickly through the app creation process. Then you’ll learn the admin setup steps so you and your team can get busy using the app for analytics. The principles and practices you learn here apply to all prebuilt apps even though all the examples come from Sales Analytics. You’ll get a hands-on demonstration of how you can start using Analytics apps quickly and what they can do for you. You’ll run through all the basics so that later you’ll know how to use any Analytics app to shine a light on your Salesforce data.